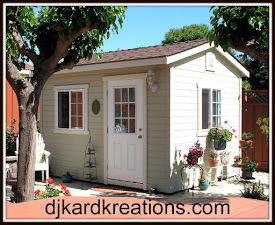 djkardkreations: Birthday Cheers and Corners! I have been out running errands and seeing to appointments since early bells and came home to find my post hadn't published as sheduelled. Dratafrat! Methinks I might need to send the hamster in for a recharge of brain particulars. Today is the birthday of my fellow BABE, Anita of My Papercraft World. I do love Anita. She is just like you imagine she would be from her blog. Warm, kindhearted, thoughtful, intelligent, and underlying all that gentility: a wicked sense of humor! Forgive the cloudy day. For Anita's card I faux watercolored the stamp "Poppy Group" from Rubbernecker using my markers and mist again. The window box embossed sediment is from Avery Elle. I hand-cut the window-box shape around the embossed letters. The card base paper is from Anita and I hope the essence of the card is also Anita. Happy Birthday, mon ami! Bisous, bisous! 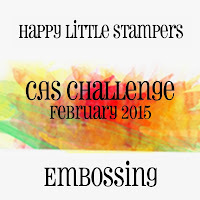 Happy Little Stampers CAS Challenge: embossing. The only thing not self-exploratory about the card might be the NBUS corner sediment die which is from Die-versions. As so often happens, I saw it used on another friend's blog and was immediately enabled to buy one of my own. (That would be you, Jules!) Of course, that was months ago, so it's happy to finally be used. Seize the Birthday challenge (w/o toppings). 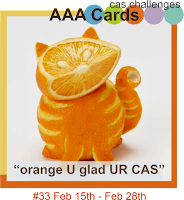 AAA Cards challenge where the brief is "orange." Addicted to Stamps and More: "Make Your Mark." My faux watercoloring was done on both cards by coloring the stamp with my markers directly, misting, and then stamping to the paper. The links will take you to the challenges for details on rules, sponsors, and prizes. I'm am so pleased to introduce you to these wonderful new friends, which brings us up to date! Pam Nutting of Pam's Paper and Ink. Pam is from New York and she has been blogging since 2014. Pam started paper crafting about 13 years ago with scrapbooking. About four years ago, she became addicted to making cards after taking a class. Now Pam is a pro at playing in challenges and she makes really stunning cards! Nina-Marie Trapani of Nina-Marie Design. Nina-Marie lives near the beautiful coast of Maine and she has only been blogging since November 2014. In addition to her work on design teams and making her extraordinary card art, Nina-Marie enjoys knitting, crocheting, beading, and scrapbooking. Her blog design itself is gorgeous, and no wonder, considering Nina-Maria has studied web and graphic design and illustrating. 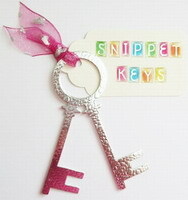 Nina-Marie also very generously offers tutorials for her beautiful designs! Shanna of The Stamping Banana. Shanna is from Ontario, Canada and she has been blogging since 2009. She loves to enter challenges and she has won awards for her fun and sensational works of art. 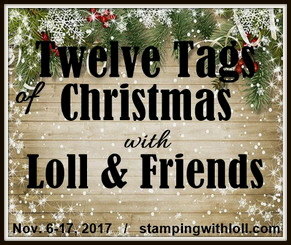 Shanna's blog is a warm and friendly place to visit for a snapshot of her life through her great photographs and writing, in addition to lots of card inspiration! Iveta Pernišová of My Paper World. Iveta is from Slovakia and she has been blogging very minimally since about 2010. Iveta loves making scrapbooks and she is now using those scrapbooking skills to design the most exquisite dimensional card art! I'm sure Iveta will very much appreciate if you took a few minutes to visit her and encourage her so that we might see her post more often! Heidi Weaver of Stamping Along With Heidi. Heidi is from Alberta, Canada and she has been blogging since 2012. Like so many of us, Heidi became addicted to the art of card making after attending her first Stampin' Up workshop in 2011. She went on to become a demonstrator. In addition to her cards and her photography, Heidi enjoys camping, hiking, kayaking, and reading. There is much inspiration and enjoyment to be found at Heidi's blog! Oh these are the very best! I like the textural feel of both these cards and I am in LOVE with the the corner die and faux stitching on the second. I just want to touch it! Oh WOW! Darnell, BOTH of these are super sensational! SO pretty and I can't even pick a favorite. Fantastic cards. I want your window box and then I go and find you've made ityourself. Dratation!! Lovely flowers. Thankyou for your well wishes. Feeling just about normal( well as normal as normal gets for me) again now. I think I fell down a large black hole without a ladder. (most inconvient). Hugs Mrs A. Two beautiful cards Darnell - love those poppies especially on the linen card - very classy! You have this watercolour technique nailed Darnell and those lovely poppies lend themselves so beautifully to it. Love the embossed planter to - so creative! LOVE, LOVE, LOVE the faux watercoloring on both cards...the added elements make them sing. Pretty flowers and window box! I hadn't seen that corner die cut! Cool! Beautiful inking on those Poppies!! two totally stunning cards, Darnell! Love the colours on your poppies! Gorgeous! Oh golly these are PRETTY Darnell!! I'm in love with the first card. Looks like a lovely little window box bursting with blooms!! Love the corner sediment on the other card too...may have to try this! This poppy flowers on both cards are just amazing, dear Darnell. I'm admiring your colouring. A dream... The first card has a wonderful background paper. Awesome cards. I love the textured papers and the water color look you did with the beautiful flowers. Two gorgeous cards, great stamp and lovely vibrant colours. Seriously AWESOME cards....love every teensy bit of them both. Glad to see you ploughing through your NBUS bits, too ;)!!!! The water colored flowers are looking so very beautiful :) love these ! I love your pretty cards! The flowers are beautiful--great job with the watercoloring! What beautiful cards you made! I especially love the poppies. I am sure your friend loved it! Beautiful, Darnell! I just love the flower box and how you embossed it. Gorgeous colors Too! I think Anita will love her card. Yowsa, yowsa aren't these lovely cards. Yes the card for Anita, looks like Anita. Why? Because of the paper, that wonderful paper that comes from England. I would not call that faux water color, it is water color. Two cards! They're both wonderful in their own right---similar but so different as well. I really like the way your flowers have turned out, Darnell, using that faux watercolour technique. I've never tried misting my stamp after colouring the image up with markers but after seeing yours, I'm itching to see how it turns out for me. I love the embossing on each card as well. The handcut window box gives the blooms such a perfect footing. The Happy Birthday card, however, speaks to me just a bit louder. I'm not sure if it's the added layers or the two angles for the sentiment, but it's my favourite. Thanks so much for sharing. Oh!2 for AAA yay! ;) thanks for joining in at AAA! Oh my goodness, that corner die turns an awesome card into spectacular! Love these two lovely cards. Fabulous cards Darnell - love them both - the white textured one is so elegant, and I love that corner die cut greeting on the other - an inspired placement. Gorgeous cards, Darnell! 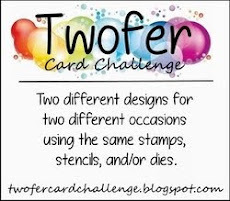 What a great idea to make two cards with the same stamps while you have them out!! I'm lucky to make one card at a time. Love the linen card on the first card it makes it all lift, excellent creation and the second card love all the multiple layers and stitching. Thanks for sharing. Wow, Darnell--you may not have pushed the publish button, but the hamster is alive & well! These are some of my favorite cards--creative & beautiful, my friend! These are gorgeous, Darnell!! Love the linen look of the paper and your fabulous faux watercoloring. So pretty!!!! Thanks for your sweet comment and congratulatory note on my blog about my milestones. Even though you are not wanting to enter my giveaways, it was so nice of you to visit!!! Love these gorgeous cards, Darnell. Your watercoloring is beautiful. I love using that technique. Thank you for introducing me. Love your blog! I think you have something there, Darnell, to make two cards every time. Both of yours are fabulous. I love your creative window box on Anita's. I've never seen a corner die like on your orange card but it looks great with all the layered panels. Gorgeous flowers! And I need to know where that white paper came from (from whence it came) so I can procure some. I think there's some space left in my I NEED MORE TYPES OF WHITE CARD STOCK drawer. Eeks! Don't overcharge that wee hamster :-) Wow, Darnell, these are so beautiful! You've done a great job with the texture, the coloring....just WOW! Both cards are absolutely stunning, Darnell! I love them! Wow! Your cards are real eye candy! Those poppies really look like you painted them! So stunning and delicate! Two gorgeous cards. Love the watercolour effect. Pick a pair of pretty cards! These are both gorgeous! I love the textured cardstock on the first with those pretty blooms, but the stitched rectangles and corner sentiment won me over big-time! I never saw the corner dies before but I likey!!! Just was over to wish Anita a Happy, Happy after seeing that it was her big day when I visited Kim. Love, love both these cards. I'm gonna pick #1 as the fav (even though #2 is equally fab). My 1st glimpse looked like it would be cross stitched. The texture in the paper is marvelous with the w/coloring (which is just great!) The sentiment window box is a terrific die, new to me. And love the different look in #2 with the same image, but different treatment. Of course I love the stitched dies, and that side die treatment is splendid. Haven't tried that. Looks spiffy & grand. WTGo! TFS & Hugs too. Both are just gorgeous, Darnell--love the watercolor look! Clever window box too--cutting it out around your embossed sentiment was a great idea. And I haven't seen the corner dies before but that's another cool sentiment design. Gorgeous cards, I love the watercolour effect, especially on the textured card, it really does look as if it's painted. What a wonderful water color effect you achieved on both cards. I have been wanting one of those corner sentiments too. DRAT IT DARNELL! You've gone and made such a beauty that I'll definitely have to have one now!! Your cards are so so beautiful, Darnell! Love how you did the flowers!! The faux watercolouring is beautiful ... so delicate and soft and so perfect for these sweet poppies, especially on the textured card, it really does look as if it's painted. Re. The Cuttlebug Mania challenge. Yup, any manual die cutting machine is fine. I think it probably began with the CB and then was opened up more. Another one for you to play in? Beautiful cards. Love the mix of colours on the Poppies. Two stunners here Darnell. Love your watercoloured flowers. Just perfect. Your cards are so so beautiful, love your watercoloured flowers, they are so nice! Oh my goodness - WOW - what gorgeous flowers and love the cool card designs you created to showcase them!! You are so incredible and these cards give my heart a lift!!! Sorry to be so slow in my commenting and visiting you but between getting ready for 10 days with my grandbabies and actually being here with them I have been just a touch busy!!! But I hope you know how amazing I think you are even when I don't get the chance to come and tell you right away!! Please have an awesome day!! Oh my goodness, Darnell! These are such beautiful cards. Love the colors and the texture. Feel so lucky to have gotten a two-fer today! These are both stunning. Love the textural feelybobs of these. Both your cards are beautiful, Darnell and the first is so perfect for Anita!!!! You made such a neat flower box for those lovely poppies!!! Love that corner sentiment on the 2nd card and all the lovely matting!!! Fabulous cards Darnell. Love that faux watercolor. Oh my goodness--just saw you won the Uniko release! A little "payback" for all your generosity, my friend--Mr. Random got it right! Both versions are so pretty, Darnell! Think I'm partial to the watercolored version. :) I also am trying to make two of each card, while I have supplies out. I usually hate to make dupes, but it really helps to make at least one other. Two beauties today here girl! love the stamping on that textured paper - and your clever cutting of the pot!! Great idea to make two-fer - since you have all the supplies out! I try to do that when I can remember!!!??? Two beauty's Darnell! what gorgeous designs, I absolutely LOVE the first one, so pretty, so perfect, love it! Two beautiful cards Darnell, your Poppy image is gorgeous and it's so nice to see it used in two completely different designs. Wow! Darnell your cards are stunning. I wonder how you got such a clean image on your first card as it looks like the base card is textured? Sorry to make your brain ache and confuse you when I entered your NUBS challenge with my two separate blogs but I'm glad that you worked it out!! Awesome cards, Darnell!The lowers are just gorgeous. Great idea to make 2 each time you make a card! By the way...I want to thank you for telling us about the Great British Bake Off! I've watched all the episodes from this season, then found the past 4 seasons on You Tube! What a great show ~ Beautiful, yummy pastries, and of course, I'm a sucker for a British accent! Lastly, thank you so much for all of your love and sweet comments on my blog...you're the BEST!!! How lovely!! I really like the card base with that pretty faux watercolor technique on the first card. The corner sentiment on the second card is so fun. I am also trying to make two of a card when I sit down. So far it has been harder then I thought it would be! Wow...two absolutely beautiful water colored cards that took my breath away! The colors that you chose are stunning together! Love the 'cheers' planter! And such warmth in all that you wrote about our sweet b-day girl Babe! AND...you spoke French! Atta girl! Both are beautiful! I love the little flower box you created, genius! Darnell, both of these cards a BEAUTIFUL! I love your watercoloring. Thanks so much for the kind words you mentioned about my work; you are so sweet and generous! And thanks for sharing your work with all of us each week. I always enjoy stopping by and reading your newest posts. Lovely technique and love the embossed planter. Great sediment !!! Oh I adore those poppies!! Absolutely fabulous cards Darnell ... Wishing you and Hammy a terrific day! Your card for Anita is beautiful. I love the way you water colored it by misting. Great job cutting a window box. It looks perfect! Only over 100 comments!! LOL!! I love this kind of post, showing how you can use the same image in two completely different ways! The first one is so classy with the textured background, but I love the effect of the orange frame too and the way you placed the sentiment. They are both so dreamy, Darnell! I just want to touch them... Bravo! Darnell, I need to take your idea and make more then one card with same idea..boy would that help get my inventory back up! 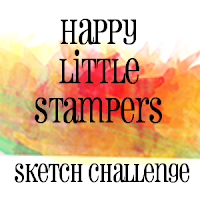 I also need to become a faster stamper. Love both of these cards...and the texture on both of them! Well done as always! 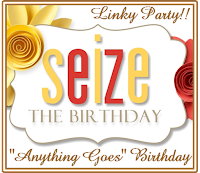 Thanks for linking up with us over at Seize the Birthday...it's always nice when you join us! just one thing I can say : Beautiful ! Hello, Sandy from Sandy's Scrapbookin's here. Thank you for following! I had to jump over here and say I and now I am YOUR newest follower, lol. Hope you have a blessed day. Both are gorgeous, Darnell! I love the single layer and the framed one, you are smart to make up more than one. Happy Birthday to Anita! Darnell, I love many things about these cards!! I love the idea of the embossing sentiment as a part of the scene and I really love how you displayed the happy birthday In the second one!!! So so pretty!! Thanks for playing at ATSM!! Two more lovelies, Darnell! The Poppies are just beautiful and the window box is genius, my Dear. Another fab creation (or should I say two--great idea btw)! Love those poppies in the bright, cheery colours! Thanks so much for joining us at Seize the Birthday! Wow, these are both gorgeous Darnell! I love how the first one has the watercolor look on that textured background and I love the sentiment placement on the second one. I will have to give that a try! Thanks for the inspiration! So glad you are making two cards. I try to do the same! Great use of the Orange in the second card, and I love the water coloring in both. So glad you joined in with AAA this challenge. Always enjoy reading what you're up to.